Natto is a traditional food made by fermenting steamed soybeans with a bacillus agent. The bacillus breaks up the protein in the soybeans, leaving them soft, sticky, and brown. A valuable source of protein, vitamin B2, and enzymes, natto was first made in the late Edo period (1603-1867). It is usually eaten mixed with minced negi (ねぎ green onions), wagarashi mustard, raw egg, and shoyu (醤油 しょうゆ), as a side dish for rice. Natto, fermented soybeans, production averages 220 thousand tons a year. This is equivalent to 4.4 billion 50-gram packs. Natto has been proven an effective deterrent of osteoporosis and blood clots, and its popularity is on the up swing. Consumption patterns vary by region, however. 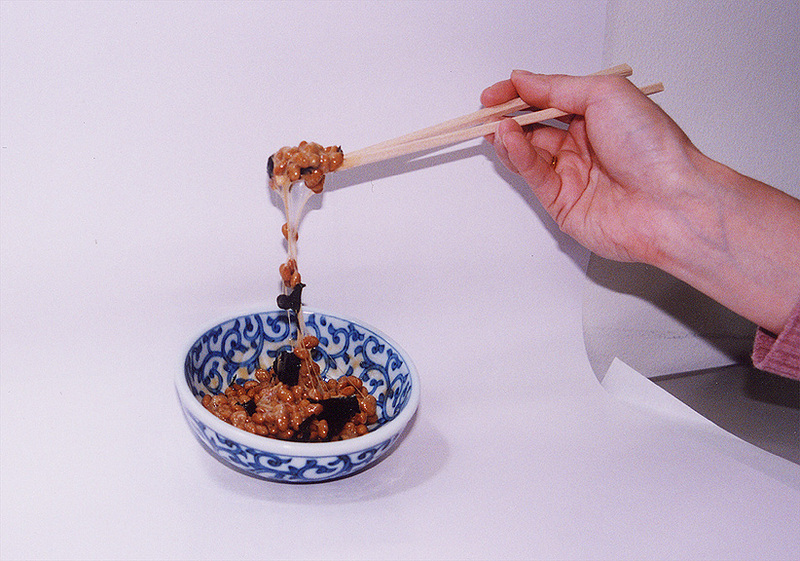 Residents of western Japan generally consume less natto than people in eastern Japan. Natto's distinctive odor and sticky consistency apparently detract from its popularity in western Japan. Most recently, a new type of natto with very little odor has been introduced as well as a variety of natto dishes, which effectively suppress natto's typical smell.